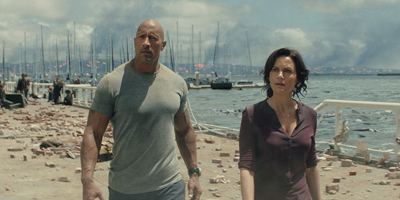 After the infamous San Andreas Fault finally gives, triggering a magnitude 9 earthquake in California, a search and rescue helicopter pilot (Johnson) and his estranged wife make their way together from Los Angeles to San Francisco to save their only daughter. But their treacherous journey north is only the beginning, and when they think the worst may be over...it's just getting started. I so wanted to watch this at the Cinema but never got round to it.As I expected the storyline was weak.I simply wanted to see it for the special effects,it's for those special effects why I gave the movie 3 Stars,Some were downright unbelievable but others left me gobsmacked as they were so believeable.I'd say if you like an all out Action movie then this is a good choice if you can't find anything else to watch on your tv package.A movie of two halves really as it relies so heavily on the special effects and not the script and Charater development.I would however watch it again! ?Just for the action.